Every homeowner would like to get wood flooring.Carpeting as a wall to wall flooring choice is not here anymore. Wood is the option of choice nowadays. Question is, are the benefits outweighing the extra expenses? Let's take a look at some of its benefits to decide. Hardwood floors are the only type of flooring known to last even 100 years or more. Unlike other type of flooring that fail the test of time, wood floors gain character and beauty as time passes by. Wood, unlike carpet, doesn't promote the collection of dust, mold, hair etc. Hardwood is a first-class option for people suffering from any kind of allergies. Unlike carpet which cannot be entirely clean even when steamed regularly, hardwood floors are easy to be kept clean, therefore contributing to the overall health of both, you and your family. The hardwood floors will give your house the elegance and sophistication that no other type of flooring will. A well designed floor will make your furniture stand out, your walls etc. Your home will feel warm and inviting, giving it that "homey feel" we all like to achieve in our houses. Regardless of the décor of your home, traditional or contemporary; modern or retro, hardwood floors will add a touch of distinction to it. They will enhance your furniture and other accessories allowing you to create any ambiance you choose, from warm and cozy to modern and slick. Unlike carpet floors that need to be cleaned every 6 month and replaced every 5-10 years hardwood, once installed, it will not need any investment for a very long period of time. The type of finishes used nowadays are so strong, they will not require refinish for at least 15-20 years, and the floor itself will probably last for generations, therefore, making the wood flooring the most economical flooring option. The best hardwood floor cleaner is sitting right in your kitchen cabinet. Mix 1 cup of vinegar in a gallon of water, take a mop out of the closet and you are half way done cleaning your wood floor. Always make sure to use a damp mop, because excess humidity can damage your floor. All it takes to keep a hardwood floor clean is a little mopping. No steaming, no vacuuming, no time or energy consuming tasks. Use the time saved to spend it with your loved ones. Go out and enjoy. You deserve it. You know that, one day, you will be looking for a different property. We all do. This is why, before choosing the type of floor for your house, you wanna think about how will this choice impact the selling process. Hardwood flooring had been for a long time, one of the first features home buyers are looking for, when searching for a home. Having hardwood flooring in your home, it will definitely increase its value; it will attract more prospects, therefore, making it a hot item on the housing market. 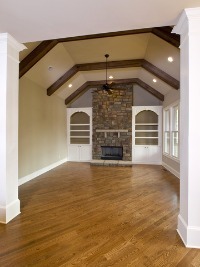 If selling is something you have in mind, either now or in the future, wood floors are the option to go for. Wood floors, now, can be installed almost anywhere in the house, even in the kitchens and powder rooms as long as you choose them accordingly. Not many years ago, hardwood flooring represented an option available exclusively for the people with high income. This is not the case anymore. Today, the pallet of wood flooring options is huge, varying from very affordable to very expensive. A good flooring professional can turn an affordable flooring material into a "million dollar" looking floor. The huge array of wood essences, width, patterns along with the multitude of stains and finishes available will offer you the opportunity to create a floor like no one else before. Use your senses, listen to the advice from your contractor and you will finally bring in your home the one element that will make it unique, drastically enhancing its appearance and style. If you are looking to upgrade the flooring of your home, hardwood floors are the best option to look at. They are versatile, elegant, healthy, durable and, equally important, affordable. Inform yourself, hire the right flooring professional and you will never regret the choice you made.